Miles Daisher skydives over Lake Tahoe Friday in a kayak. His invented sport, "skyaking," has attracted international attention. Miles Daisher must have driven his parents crazy. As a child, he was always climbing up to high places and jumping off. By the time he reached his teens he was jumping off way-too-high rocks at the Yuba River. While in a fraternity at Chico State, he stacked up mattresses on the ground and jumped out of an upper level window — a crowd-pleasing feat that should never be re-enacted by anyone. 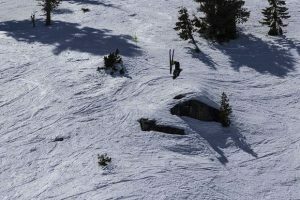 During a season as a “ski bum” in Squaw Valley, Miles and his buddies perfected their stunts on a trampoline in their living room. In 1995, Miles found a true passion — skydiving. But after two years, he discovered an even greater thrill — “BASE jumping,” which is parachuting or “wingsuit” flying from a cliff or structure. The term “BASE” is an acronym for jumping off points, such as buildings, antennae, spans or earth (such as cliffs). Jumping from lower altitudes makes BASE jumping significantly more dangerous than skydiving, and the sport is illegal in many places. But the I.B. Perrine Bridge in Twin Falls Idaho — the eighth highest bridge in the United States — is purportedly the only made-made structure nationwide where BASE jumping is legal year-round without a permit. Therefore, it’s no surprise that Twin Falls has been Miles’ home for more than a decade, where he coaches “Miles D’s BASE Camp,” trains for stunts and jumps for fun. In his spare time he’s hired by the military to teach precision parachuting. He also spent three weeks as a stunt man for the film “Iron Man 3,” where in a scene he’s suddenly airborne when a plane blows up and is “saved” by Iron Man. Now an accomplished canopy pilot, having 7,200 skydives and 4,521 BASE jumps (as of Monday) under his belt, Miles has reportedly executed more known BASE jumps than anyone worldwide. In 2005, he set a BASE jumping record by launching 57 times in a single day, climbing a total of nearly 29,000 vertical feet. In June 2017, he reclaimed this title by completing 63 BASE jumps in 24 hours. He also set a world record for 737 BASE jumps in one year. 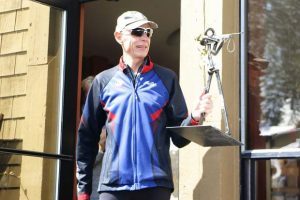 Recently, he says he’s “got his eyes set” on the Foresthill Bridge in Auburn, where he hopes to secure a permit to host a BASE jumping event, with landing accuracy contests and other competitions. On Thursday, while swimming with family and friends at Englebright Lake to beat the heat, Miles got the familiar itch to fly. 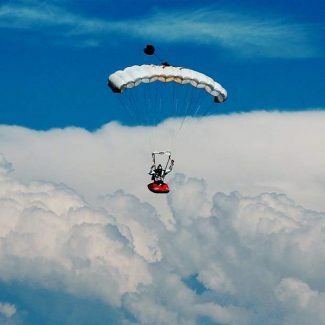 If onlookers were impressed by Miles’ carefully executed landing at Englebright on Thursday, they would have been amazed to hear what he had planned for the following day. By 1 p.m. on Friday, Miles was in a small plane preparing to parachute over north Tahoe — in a kayak. Inching toward the open door in his small kayak at 7,000 feet, Miles pushes off and is in instant free fall, using the boat to position himself properly in the air. He opens the chute at 5,000 feet. His invented sport, “skyaking,” has attracted international attention, and requires a skill level high above a typical skydiver. Thanks to his sponsor, Red Bull, he has “skyaked” over the likes of Philadelphia and Mexico — even Dubai. 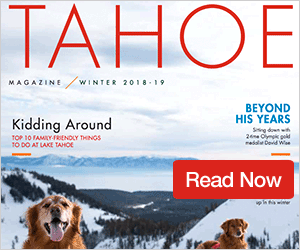 Friday was a perfect tribute to Miles’ technical skill and experience, as his parachute came to a near stop, hovering over the water at Tahoe before gently landing on the surface near a jubilant crowd on shore. Now 48 years old and showing no signs of spending more time on the ground, many wonder if these spectacular stunts concern Mile’s wife and children, ages 12, 10 and 8. But what about his parents?